Fairly soon after my initial salvation experience in Christ, I moved to embracing the theological framework known as Calvinism. You know, the 5 points of total depravity, unconditional election, limited (or particular) atonement, irresistible grace and perseverance of the saints. I had come with excitement to this new found system of doctrine. I ate it up, lapped it up like a thirsty puppy. It was a major part of my theological digestion. I began defending Calvinism with the best of them, believing I had very good and reasonable answers to many mysteries of the faith surrounding God’s sovereignty and humanity’s responsibility. I was even willing to accept some of the stronger points such as Augustine’s double predestination. And anything counter-Calvinism was just not biblical. I was even smug enough to one day comment that Calvinists tend to be intellectually smarter than non-Calvinists. God have mercy on my soul! But over the past few years, I have found myself journeying away from Calvinism. Such is well-worth noting for my own sake, knowing how much this doctrinal system was the bread and butter of my theology. There were a few steps that led to this major shift in my life. The first centred around my coming to grips with the reality of the kingdom of God. Previously, the kingdom was a palatial city somewhere ‘up there’, a place one went to when one died. I had no concept of the reality of God’s rule coming here, now, on earth. And I have continued to drink deeply from the well that God’s original purpose was his rule extended in all the earth. And Jesus has now made that possible as the crucified and risen King. I also began to get a better understanding of the church as God had designed. A people submitted to his rule and making his rule known in all the earth, in all areas of life. And this people, this bride, was to be relational at their core, not institutional. Finally, I was gripped by the power of God’s Spirit, coming to terms with the fact that every gift God has ever graced his people with was still very much active today. Not only was this true of the giftings in 1 Cor 12, but also those ministry gifts of Christ spoken of in Eph 4:11. While I continued to embrace Calvinism within a soteriological (salvation-system) framework, my heart had been gripped by far more important things. Still, as of the past few years, I have begun to let go even more, journeying away from those once strong ties to this old friend of mine. Have I been convinced of a more Arminian approach to our salvation? Or am I somewhere in the middle, accepting the Molinist perspective? I would answer such an inquiry with this – I think the typical Calvinist-Arminian debate is of a foregone era. It is part of an old paradigm that I believe is becoming less and less important in our world today. Listen. I don’t want to sound overly negative here about Calvinism or Arminianism. Each theological movement and framework serves its purpose for however long is necessary. There are seasons and cycles amongst varying groups of God’s people. Some last centuries, some last a few years. And this doesn’t mean we just lay aside everything that’s gone before us and simply go with the next whim of doctrinal discussion. Oh, yes, that would be easy, especially in our 21st century, post-modern world. I find myself easily pulled towards some of the newer discussions available. Still, what I do strongly sense is that the typical paradigm of the Calvinist-Arminian debate will no longer greatly serve the church or the world of today. And something else that we must note is this – I don’t believe the Scripture was written according to a Calvinist-Arminian template. Whether we like it or not, the overall systems are just simply not in the good book. Such was not a paradigm of those ancient writers. Paul did not write Romans as a theological Calvinist treatise. He wrote into a particular church context addressing particular issues arising within that church. Those issues were first practical and relational, though of course he did address theological points. Oh yes, Romans still speaks into our context today. I do not doubt such. But we would be silly to insist that the Bible was given to us with a more Calvinist or Arminian underlying structure. Rather, in the movement across church history, certain debates and discussions arose to which the Scriptures were then organised in a way to address those particular points and questions of concern in that day. Such arose in the late 16th century between Jacob Arminius and Calvin’s disciples (yeah, Calvin didn’t really create the whole 5-point thing). However, this was not at the forefront of discussion in a more New Testament era. So here we are, over a decade into not only a new century, but a whole new millennium. And I can honestly say that I believe there are more important, more pressing paradigmatic concerns in our world than that of the storied soteriological debates of Calvinism and Arminianism. What are they? Well, I’m sure the blogosphere will let you know if you don’t already. And then, in a few decades or more, certain issues will have settled or we will simply know it is time to move on. This is not a mere agnosticism to theology. This is the reality of moving forward in God’s purposes for differing generations. For some, I am sure the former debates will still stir deeply within. But, as I survey things myself, it is my simple impression, truly my own personal opinion, that this is a paradigm of a foregone era. It’s time to move on to the relevant and important things of today and not stay too well stuck in debates of a previous period. This entry was tagged Arminianism, Calvinism. Bookmark the permalink. I think the danger of locking oneself into a particular soteriological view (and I’ve never used that word before today) is that it tends to close the mind to the mystery of God’s working with men. Salvation is at it’s heart a mystery. When you take the mystery out of it, it becomes something less than it was meant to be. I don’t think we are meant to fully understand how it ALL works. And thinking that you do causes you to read scripture and work to fit it into your predetermined view instead of opening your mind to the possibilities and limitlessness of God’s grace. you made my day, my friend. You have no idea how your ‘journey away’ blessed me. Completely agree. Well, at the expense of being labeled a negative disagreeable malcontent I would have to say any reason to walk away from calvinism is a good one (I can’t even bear to capitalize the word). In fact, going a step further, I don’t think there has ever been a time when c’ didn’t cause anything but trouble for everyone. Hey Scott. You’re shifting? Who knew. Seriously though, it seems you are reacting more against the Reformed paradigm in toto than Calvinism, correct? I love my Reformed brothers and sisters but I note a consistent constraint on flexibility that imposes this very stringent lens to consider ones theology. There is little room to go elsewhere. From what I’ve observed in all your musings over the past few years, I note the various deviations and wonder if you are not reacting against the entire Reformed system. Sometimes when someone reacts to a component of a theological paradigm they end up dismissing the entire thing. I’m not saying that’s the case but I’m just wondering. Thanks for stopping by and commenting. The point of this particular article was the Calvinist perspective. As you rightly recognise, it is only a ‘subset’ of reformed theology. Most people don’t realise it. It’s not so normal to find one like CMP who is Calvinist and dispensational. But such is the reality of theology today, very eclectic across many peoples lives. I am an example of this too. Now, yes, I have pulled away from much of reformed theology, but I have to admit I was never fully on board with all reformed theology. My thoughts of church and the Spirit of God are not so reformed. But I did appreciate more reformed eschatology and covenant theology. Still, I don’t think reformed theology serves as the best paradigm for biblical theology, at least today. It has served its purpose, but fresh paradigms must be considered for today. So, yes, overall I am challenged the larger system of reformed theology. But that is a little bit of a misnomer because I never fully embraced it all from the beginning, nor do I think it is completely irrelevant. But I focused in more on the Calvinism stuff because it is what people know more. Now I am wondering if I leave a link to this article in the Facebook page for my seminary. LOL! “It’s not so normal to find one like CMP who is Calvinist and dispensational” *clearing throat and raising hand* Yep, me too. So I think it is an important distinction to make, Calvinism vs. the entire system. While I embrace many tenants of Reformed orthodoxy, I confess to being a theological mutt. And I’m fine with that. I call myself an Eclectic Calvinist! Note, I am Historic (Covenant) Pre-Mill, and somewhat friendly with the PD (Progressive Dispensationalism). Btw, see Michael Vlach’s book: Has The Church Replaced Israel? A Theological Evaluation. Just a gem on the history and somewhat rebuttal on Superessionism. Not harsh at all, either. You mock the notion, but you don’t understand it. You ignore the historical fact that physical Israel of the bible may not be known today. That the people called “Israeli” today may be largely someone else historically. The biblical House of Israel (the bulk of the nation) was largely taken to Assyria. This the prodigal son never returned (says Josephus). The House of Judah was the stay-at-home that represented only Judah, Benjamin and Levi; two and a half tribes. When you speak of ‘Israel’, you unknowingly think of ‘the nation of Edom’ forcibly converted to Judaism (under John Hyrcanus) integrated into the “House of Judah”. (Historically these are the Jews, but not all Jews are Israel [Rev 2:9, 3:9], and not all Israel are Jews, in fact most weren’t. You also presuppose that the ‘elect’ and ‘saved’ are one and the same, but this could also be a wrong assumption. Consider that Israel is clearly God’s elect [Isa 41.8-9][Isa 43:10][Jer 31:33][Rom 9:4], and yet in [Isa 56:2-7] God ‘saves’ non-elect and elect alike. If it turns out that “those who have faith, these are the sons of Abraham” are sons of Abraham, whether or not they call themselves Israelites God knows, and indeed the (Abrahamic) tree, the Kingdom of God will be known by its fruit. It’s interesting, too, that the Eastern Orthodox Church, which never had a Reformation (because, its members allege, they didn’t need one!) knows nothing of the calvinist/arminian divide yet produces some fine, godly believers. I have to agree with Bishop Ryle. Some people tend to worship the scripture rather than a scripture writer. Well, paint my face red. When I posted that comment, I was very tired (went to bed right afterwards). Coming back just now to see I messed it up. That should be “worship the scripture rather than THE scripture writer.” Hopefully my error didn’t confuse anyone. Fascinating post, Scott. Great to see you have left Calvinism behind. Welcome to Christianity! Molinism? Ugh! Modern “American” Calvinism Ugh, in certain places! 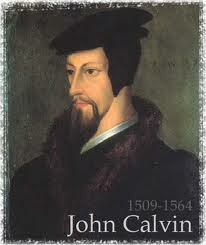 And John Calvin, is much more than just his Institutes! I am sorry to hear – most – that you have gone toward Open Theism! See John Frame’s book: No Other God, A Response To Open Theism. “A devastating critique” to quote old Roger Nicole (RIP). And btw, note, I am an Anglican Reformed “Calvinist” (see the Anglican Articles 1615), and I am also Historic or Covenant Pre-Mill. And Bishop Ryle was a great “blblicist” and moderate Calvinist! And I would in many places argue that the Wesley brothers, were actually closer to Luther and Calvin, than Arminianism. Note, “places” on the latter! Why does Iris want to hang Lican? What did Lican ever do to her? Where did I say I was open theist? Interesting all the guys you mention are of a foregone era. I’m not saying the Calvinist (or Arminian) framework did not serve its purpose in church history. I’m just not sure that purpose will take us forward in the 21st century. Or Calvinists are going to need to rethink some things in being evangel-relevant in our world today. It’s not going to grip America, it’s not going to reach post-Christendom Europe, and it’s probably not going to grip the developing world. Scott: You surely know Molinism is the theological backdrop of Open Theism? As an old teacher myself, and historically oriented, I have been around and across Europe myself, though I confess not much in the last 5 years or so. But as a boy and even teen we used to go to Europe, in the summer quite often. And of course I was a RMC, Royal Marine for over ten years, and we were often in Europe at times, though too Israel, as I have mentioned, I fought in Gulf War 1. But I love certain parts of Europe, and people certainly. My oldest son is in college in the greater London area, and we still have a home there. But sadly in my opinion the greater part of post-Christian Europe, is just at best baptised pagans, noting 2 Tim. 3:5! Though I confess there is a nice polish on the Europeans, after being in the US for a few years! 😉 But Obama has so screwed up America, in just a few years! But I love the Americans, for the most part… what ya see is what ya get with them! My youngest brother (Irish) is an American citizen now. He was a US Marine in the 80’s. I am not sure I have seen Molinism as the backdrop to open theism. But I haven’t kept up a lot on these areas. Still all seems a paradigm not too important for today’s world. Scott: Once ya get your head too much into today’s age and world, then your gospel will surely be compromised, (at best!) And one thing I am certain of, one cannot form their “gospel” in or around today’s Postmodern culture! Btw, just a question, where did you get your seminary education? A friendly question. My point here is, that we all come from some “place”! You said: Once ya get your head too much into today’s age and world, then your gospel will surely be compromised, (at best!) And one thing I am certain of, one cannot form their “gospel” in or around today’s Postmodern culture! I’m not sure how to respond to that. Do I refer to it as just plain silliness or arrogance or what? I suppose your forefathers said the same thing of your generation. Alas, the persecuted can easily become the persecutees (https://prodigalthought.net/2010/09/16/the-persecuted-becoming-the-persecutors). I studied at a reformed seminary. I know we have come from somewhere. But doctrine also develops and changes in our lives. I suppose you have had personal shifts. It is ok. PS..I hope you can get my point here, this is not just so-called “Calvinism” verses whatever, but the truth of the Word of God, which is always first sovereignly grounded in the doctrine of God! I don’t see a centre in your biblical theological approach, but in toward the culture? And again the ONLY effect for the culture is the challenge of “spirit and truth”! Let me share this link with you Scott, there is much truth in this nice post! Synergism is just a Greek way of saying “co-operation,” which in turn is just a Latin way of saying “working together.” Paul uses the corresponding Greek verb when he describes himself and his colleagues as “co-working” (2 Cor. 6:1) with God as ambassadors for Christ, through whom God urges people to be reconciled to himself (ibid., 5:20). Monergism, a much more recent term, means to work alone, having no co-worker. So monergists are those who think that in some respect God works alone. The crucial question is: in what respect? The standard Protestant view is monergism with respect to justification: God alone renders us just or righteous in his sight, without our co-operation. But most Protestants would add that sanctification is a co-operative enterprise in which our will and work have a necessary role to play, working together with the grace of God. So most Protestants are monergists about justification but synergists about sanctification. And since justification by faith alone is all that is necessary for salvation, most Protestants are also monergists about salvation. Of course in order to be thoroughly monergist about justification one must also be monergist about the faith by which we are justified, understanding it to be a divine gift resulting from grace alone and not from human work. Luther, in effect, insisted on this type of monergism when he excoriated the medieval nominalist notion of “congruent merit,” according to which sinners work to acquire the gift of “first grace” (meaning roughly, the gift of conversion and true faith) by praying as well as they can, trying their best to “do what is in them” (facere quod in se est) even without grace. The term “synergism” seems to have come into use for the position rejected by the Lutheran orthodox theologians when they reaffirmed Luther’s doctrine in the Book of Concord in 1580 (see especially article 2). Later, Calvinists used it to describe the Arminian position that our free will has an independent role to play in accepting the gift of grace. Synergism, for both Lutherans and Calvinists, means the teaching that grace does not simply cause us to have faith, but rather makes an offer of salvation which it is up to us to accept or reject. Both Lutherans and Calvinists reject this synergism, and thus can aptly be labeled monergists with respect to the gift of faith. The question of whether Augustine is a monergist or a synergist is more complicated. For one thing, even at his most monergistic, Augustine does not deny that we are active in our own salvation. Augustine is a monergist with respect to the origin of faith, for instance, in that he sees it as resulting from prevenient or “operating grace” rather than “co-operating grace” (his terms). But for Augustine this does not take away the role of human free will, for what prevenient grace does is precisely to move our wills so that they freely will the good. Hence for Augustine grace never undermines or replaces free will. In that sense he is never a radical monergist, as if the human will had no active role to play. On the other hand, he is indeed a monergist in a less radical sense, because for him the gift of faith is wholly the work of God, since even our freely willing to accept God’s gift is a work of grace alone. So in that sense, Augustine is clearly a monergist with respect to the gift of faith, unlike the Arminians. Ultimately it is up to God, not us, whether we freely choose to accept what God has to give us. However—and here is the real complication—this does not make Augustine a monergist with respect to salvation. The reason why is that Augustine does not have a Calvinist concept of saving faith. For he does not share Calvin’s distinctive new doctrine about the perseverance of the saints, according to which everyone with true (i.e., saving) faith is sure to persevere to the end and be eternally saved. For Augustine, you can have a perfectly genuine faith but not persevere in faith to the end of your life. There is no guarantee that believers will not lose their faith and thus ultimately be damned. Hence no matter how true your faith presently is, that does not mean you are sure to be saved in the end. Consequently, Augustine’s monergism about faith does not make him a monergist about salvation. About salvation Augustine is a synergist, explicitly drawing a contrast between “operating grace” (i.e., the grace that works in us), which is monergistic in its granting the gift of faith, and co-operating grace (i.e., the grace that works with us), with which we are co-workers in the journey of faith, hope and love by which we come to eternal life in the end. In Calvinist terms, Augustine is a synergist about sanctification like most Protestants, but because he thinks sanctification is necessary for salvation unlike most Protestants, he ends up being also a synergist about salvation—despite being a monergist about faith. A good illustration of Augustine’s distinction between operative and co-operative grace is the late treatise On Grace and Free Will, 33. Addressing the issue of how a person comes to love God (in Calvinist terms, the issue of sanctification rather than justification) he asks, “Who was it that had begun to give him his love, however small, but He who prepares the will and perfects by his co-operation [synergism!] what He initiates by his operation [monergism]? For in beginning [i.e. in the initial choice to have faith, from which charity springs] He works in us that we may have the will, and in perfecting works with us when we have the will.” In Augustinian terms: prior to any co-operation of our will, operative grace produces faith (i.e., a good will) in us, then from faith springs charity, which works together with the (co-operating) grace of God in the journey to eternal life. In Calvinist terms, again, this amounts to monergism about faith, but synergism about salvation. However, as I mentioned above, there is a radical sense of the term monergism in which Augustine is not a monergist at all. This is the sense in which “grace alone” excludes any exercise of human free will, even one which is wholly a gift of prevenient grace. One reason often given for this radical monergism is a yet more fundamental monergism—call it “absolute monergism”—in which the answer to the question “monergism with respect to what?” is: “absolutely everything.” This amounts to a denial of the existence of what the Christian tradition calls second causes. It means that only God, the First Cause, has real power, and that neither human free will nor anything else in creatures is a real cause of anything that happens. This absolute monergism could thus also be called “mono-causalism.” It is contrary not only to Augustine and the whole Catholic tradition, but also to the Westminster Confession, which teaches that the eternal decree of God by which he does “ordain whatsoever comes to pass” works in such a way that “neither is God the author of sin … nor is the liberty or contingency of second causes taken away, but rather established” (3.1; cf. also 5.2). The point of this teaching, which is couched in the language of Thomas Aquinas and agrees with his doctrine, is that God’s working in all things does not mean that creatures have no power to work, but rather that the creatures’ power, will and work derive from the work of God, and precisely for that reason are real, just like all God’s works. God’s primary causality therefore does not undermine or replace the secondary causality of creatures, including their free will. God has ambassadors, apostles and other servants with a will of their own and work to do, even while he is always indispensably at work in them. The two forms of causality are not incompatible or in competition with one another. Mainstream Calvinism is thus at one with Catholicism in rejecting absolute monergism. The place to locate the difference between Catholicism and Calvinism concerning monergism is rather in the fact that the whole Roman Catholic tradition since Augustine is synergist about salvation. For Catholicism our works of love (made possible by operative grace in the beginning and aided by co-operative grace throughout) are necessary for salvation. That’s precisely the purport of Trent’s denial of the sola fide: faith alone is not enough for salvation without works of love (Decree on Justification, articles 10-11). However, there is a division within Catholicism on the point about monergism with respect to faith. Whereas one important strand of Catholic theology, including Aquinas and the Dominican tradition, promotes an Augustinian monergism about faith, another strand, most powerfully represented by the 16th-century Jesuit Luis de Molina, defends a form of synergism about faith. Molinism is thus something like the Catholic form of Arminianism. In the De Auxiliis controversy around 1600, the Pope adjudicated between these two positions, decreeing that both were legitimate and neither side could accuse the other of heresy. This was of course not a relativist move: the two positions are probably irreconcilable, and if so then at least one of them is in error in some way. But the pope’s decree meant that such error is not heresy and does no harm to the faith, so the debate may continue but must do so in mutually respectful terms. There is of course no one on earth to adjudicate between Catholics and Protestants. But perhaps it will help to be aware, at least, of the difference between absolute monergism and the more modest monergism about faith, justification and salvation which is the legacy of Luther and Calvin. Dr Phillip Cary is Professor of Philosophy at Eastern University. Hey dude I’d like to hear what things you have “abandoned” for lack of a better word. We should Skype sometime anyway. Hi Jeremy – I did send you an email. Hi, Scott, dropped by to peruse. I normally don’t interact in this space but… well, I figure I ought to. You’ve gotten enough congrats for decalvinizing. So I guess you can take one more expression of a contrary sentiment. One nano-second holding to propositions that are not Scriptural is too long. However, in my hum-bull opinion that would not therefore apply to the glorious truths expressed in the soteriological expressions labeled as “Calvinism.” I’m sorry to hear, though I knew it already, that you reject these. What’s odd is that in your post on leaving Calvinism you list multiple… I don’t know… reason-oids… behind it. I looked in vain for one that was really relevant. Two words: Puh LEEEZE. Whatever the circumstance of the writing of epistles such as Romans, they communicate truths that are validly derived from the writings and understood as propositions and these in turn compared and understood in balance with other propositions. So ‘systematic’ is not a la mode in this current day. Be bold, go against the flow. As a pastor, the content of what you teach is important. Do the Scriptures teach us to give glory to God? Recognize that we have nothing that we have not been given. That we have no position to boast of before the Lord? If so, you’re a Calvinist in your soteriology. If you want to retain a ground for boasting. That your acceptance before God was even a teensy weensy bit to Scott’s credit, then maybe you aren’t a Calvinist after all. I would be curious about your rejection of the specific “five points” and some relevant reasons for why you belive these don’t express the truths of Scripture on how we are justified before God. Vague generalities seem to please some, but you know me, I’d like something a tad more substantial. I did give reasons as to why I have moved away from Calvinism. It was simply reasons that you, in particular did not like to hear or appreciate. But I was drawn to something bigger in the beginning that made it of much less importance. And I now don’t see it as something carrying the church forward today in preparing God’s people to impact our world. Yes, I still believe that the paradigm questions that Calvinism & Arminianism address are not specific questions being addressed within the narrative framework of first century Christianity. I’m not saying there wouldn’t be some overlap and connection. But the issues addressed in a more Jewish-Gentile 1st century Christianity are a little bit different than 5th century or 16th century or 20th century western world. Now, having said that, I don’t believe the questions and issues that arise in latter centuries is bad or cannot necessarily be addressed by Scripture. Of course they can. But I think that the normative questions of the C & A debate are not inherently part of Romans or Galatians or Ephesians. And I am also more and more convinced that the normative debate around the C & A paradigm is not going to carry the church forward into the 21st century. It am not sure it will strongly grip the church nor draw the world to Christ. It has served its purpose, just as a robust debate around other issues or foregone eras. I’m just not seeing it being greatly important to what God is actively looking to do today in planet earth. I just don’t GET this argument that I hear from Calvinist all the time. Accepting a gift simply isn’t something that gives YOU any glory. It isn’t in the real world and it isn’t in the spiritual word, either. When someone gives me a gift for my birthday, and I unwrap it and open the box, I don’t then turn around and say, well, thanks for the gift but, you know, *I* opened it and all so it’s almost like it was all my gift to myself. Such a thing would be ludicrous in real life, and such a thing is the same in the spiritual realm. Accepting the gift of salvation doesn’t give me ANY room to boast about anything. On judgement day I will throw myself at the feet of Christ and pour out my thanks in tears for the gift of salvation and for giving me the CHOICE to accept OR reject that gift. I recognize that my free will is also a gift from God. He COULD have put me on a predetermined path (and would have been entirely justified in doing so), but scripture teaches that He DID NOT, preferring that we CHOOSE His will over our own. His will being HIS plan for our redemption – namely the work of Christ. Our own being any OTHER manmade device to reach or justify ourselves before God. Again I just don’t GET the argument. Maybe I need to be further enlightened. This whole issue is a logical fallacy (an argument based on incorrect demonstration, as a vicious circle) for real Calvinism! Well, then, please enlighten me. What is wrong with my argument? Are you saying I don’t really understand Calvinism (or this particular part OF it)? That may be true. But I’ve always thought that Calvinism teaches that if I can CHOOSE salvation, I can take credit for it which means I can boast in heaven. Therefore, I don’t choose it, God chooses me. Again, seriously, please tell me where I’m wrong. And try to use language I can understand. More often than not, I only understand about 60 to 70 percent of your posts, Robert. I’m just a regular guy. I didn’t go to any seminaries not do I read books about theology (beyond the Bible). However, John 15:16 can easily be interpreted to refer to the election to SERVICE to God, not salvation (especially compelling because while ALL the disciples were called by Jesus for service, Judas certainly was NOT chosen for salvation). Not only that, but in much the same way there were those that Jesus called (chose), but some did not respond favorably to the call, I believe that God chooses all men to follow Him, but not all respond favorably to it. After all, I can choose you to be on my team, but that doesn’t mean you’re going to join. God wants (chooses) us ALL to be on His “team”, but some would rather go play by themselves. But of course, as you say, we couldn’t be saved at all unless He chose us in the first place for salvation. A gift not offered can’t be accepted. We are helpless to save ourselves. So, do we have ANY truly free will or not under ‘Biblical Calvinism’? And if we don’t, what do you do with verses that seem to show that we do. ‘Biblical Calvinism’, in fact includes this whole point, that God is responsible for my will and my whole ability in “regeneration”, to understand and even come to God In Christ! Also Ken, perhaps this link might be helpful? Even as a Calvinist, this link is also good! I have always said that the Wesley’s were closer to Calvin on so-called Free-Will. Indeed true Calvinism always sees “regeneration” first! While I couldn’t agree with the thoughts of the first link, I find a great deal of merit in the teachings of the second one. I agree that we ONLY have the ability to choose FOR Christ because God’s Spirit strives with us. But I believe His Spirit strives with every man, either resulting in his eventual conversion or in the Spirit abandoning him to His own insistence on remaining blind. No man knows at what point one of those two things will occur. That’s why the scriptures warn us to take heed when the Spirit does call lest it become “too late”. A choice to reject proves there is a choice to ACCEPT (even if that choice is only available due to the grace of God). It’s still a choice, and affirms free will. Free will apart from God’s intervention only exists in a cursed capacity, in that even in his BEST efforts, he still is not really pleasing God with his choices, as self-righteousness is just as damning as unrighteousness. Only through the opening of his eyes by the Spirit can he begin to glimpse the third, true choice: Christ-righteousness. Will he accept the truth and receive more of God’s grace, leading to salvation, or reject and shut out the Spirit’s truth, resulting in destruction? So maybe we aren’t as far apart as I thought in our beliefs? Most time when I take the time to spell out as an Arminian what I believe, most Calvinists say: “Oh, we aren’t that far apart after all.”. Your statements above would be one such example. So Scott, what points specifically did you leave about Calvinism? I am not sure after reading your article. And the next question – what answers have you found that address this era better than the Calvinism – Armenian debate? I can see that you say that you left Calvinism, and do not consider it to be as relevant for this time than something else, but what is the something else? I hope my departure from a specified reformed Calvinism is not too upsetting. Particularly, I no longer see myself embracing limited atonement, nor the typical reformed view of depravity. The bigger swing in my life is away from the paradigm that puts systematic theology at the height of biblical study and interpretation. I don’t think we can completely remove ourselves from such practices. But the canon of Scripture is a library of books, not so much one book that says the same thing at every turn. And so I need to let Matthew speak as Matthew, Peter speak as Peter, James speak as James, etc. I find that most reformed theology tends to place Paul at the top and seeing how everyone else can fit into his perspective. I’m not trying to pit the biblical authors against one another. I’m just trying to say James has a voice quite different from Paul, and we need to allow them to sit next to one another, rather than enfolding James into a Pauline perspective alone. In all, I am trying to approach things from the more narrative-historical hermeneutic than systematics. Hi – hope it’s not too late to join in the discussion. Thank-you for your post. Most interesting. And relatable. What tends to bother me most regarding these kinds of discussions is that there are numerous really smart, good-willed and well-intentioned folks on both sides (i.e. Calvinism vs (for instance) Open Theism) of the “equation”. And ironically, both sides will use many of the same scriptures to justify their respective positions. Because I live in the Twin Cities (MN), John Piper and Greg Boyd immediately come to mind. If PhD’s with deep knowledge of theology, language, history and culture can’t agree, then how is the average person supposed to ascertain what is true vs what is false. As is, I can’t comprehend Calvinism and Open Theism both being “right”. Therefore, at least for me, Christian faith has devolved into little more than personal opinion. But just because I “feel” that Calvinism is fraught with significant error, my antipathy to Calvinism doesn’t make it wrong. I hope it is. But that’s just this guy’s opinion. I have never understood the pull of Calvinism. When I read the Scriptures, I see a loving God who would have all men saved.